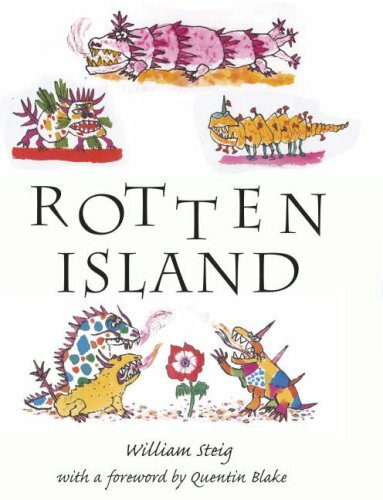 Rotten Island admirably sets the pace for such a move. It is a wild account – hardly a story – of a place of terror, fear and ugliness which comes to be transformed by flowers. 25 pages are given over to a menagerie of monsters, whose almost chewable descriptions are as hilarious as their portraits: ‘fat or scraggly, dry or slimy, with scales, warts, pimples, tentacles, talons, fangs... clacking shells covered with grit and petrified sauerkraut...’ There is an electric ferocity to the drawing which brilliantly shifts gear as a night of cleansing rain brings an irenic ending and: ‘it wasn’t long before the first birds came to the new, beautiful island’. Steig aficionados will be interested to know that in 2007-8 the Jewish Museum of New York held a Steig exhibition accompanied by a volume of drawings and essays celebrating Steig’s life: The Art of William Steig, Yale University Press, 2007, 978 0 300 12478 1.